Image: The world is different at night. 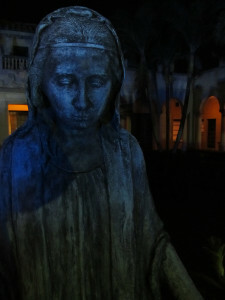 Courtyard at St. Edward’s Church, Palm Beach, one Maundy Thursday. How lovely! I feel as if I’ve visited them with you already. We had a very touching celebration of Living Stations of the Cross last Sunday. There was a little speaking from the small crowd of people who witnessed, though hardly any. I hope to find some churches open. There is humble, touching pleasure in the poetry and education of your words, John. A “gentle heart” quietly unfurling, tentative and strong,in reverance and Old Ways. Thank you for lighting the way.